Hi, friends, I'm also Newbie and really like this community because here I can get much knowledge about many things it's really great community for me what about you friends? Welcome. Use the time to read up on how cable broadband works. Some things to check are that all your network cards and ethernet cables are gigabit capable and that your wifi cards/devices are also capable of handling the speed. If you've been on ADSL for a long time you may not have noticed that your wifi in your computer is out of date. A lot of modern laptops still ship with slow single stream 802.11n wifi adapters with one antenna. To be capable of 200Mb at close range to the hub you need an ac wifi adapter that can connect at around 400Mb, as you get around half the throughput of the connection speed. For 802.11n wifi, it's 2/3rds of the connection speed. Though most adapters default to 72Mb connection, thus giving you only 48Mb of throughput speed at best. 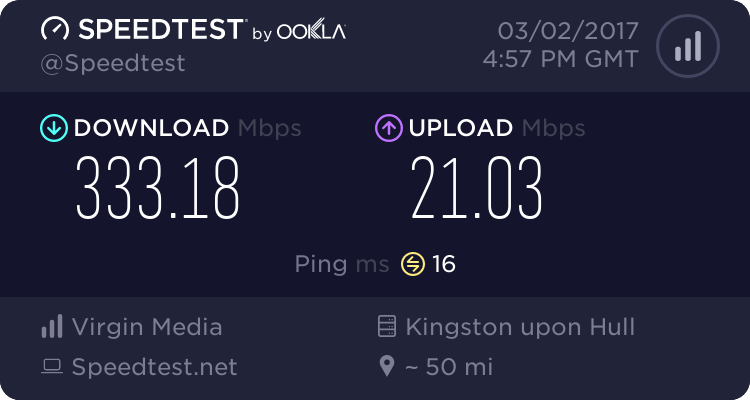 Often new people come on here and complain about their new 200Mb connection doing only 50Mb over wifi or 85Mb on ethernet and this is often why. So plenty of things you can do in preparation.